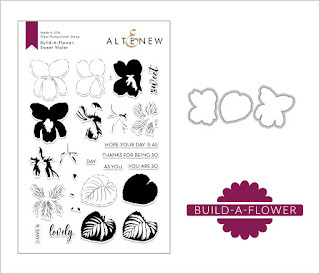 It's time to share another exciting Altenew Build-A-Flower with you. If you arrive from the blog of Susan Wymer, you are in the right place! For my take on this BAF, I set out to color the petals. First, the violet flowers were all white-embossed on vellum. With the coordinating die, it was easy to make the precise die-cutting of the flowers and leaves. For the coloring, I colored the petals directly at the front of the petal (not on the backside). The large space of the images made it easy to color. I decided to arrange the Sweet Violet into a wreath-like design. The wreath was embellished with Altenew Enamel Dots and gold strings. 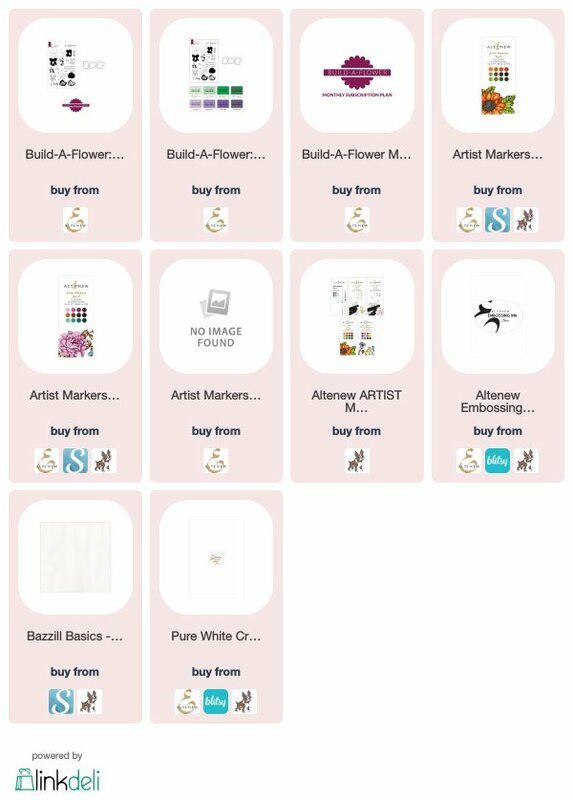 All products are listed below for your shopping and reference. Prizes: to celebrate this release, Altenew is giving away a $30 gift certificate to six lucky winners! Please leave a comment on the Altenew Card Blog and/or Altenew Scrapbook Blog for a chance to win. Three winners will be announced on the Card Blog, and other three winners will be announced on the Scrapbook Blog on 4/9/2019. AND Altenew will draw a winner to receive a $15 Altenew Gift Certificate from the comments left on each designer's blog on the blog hop list (including mine!)! 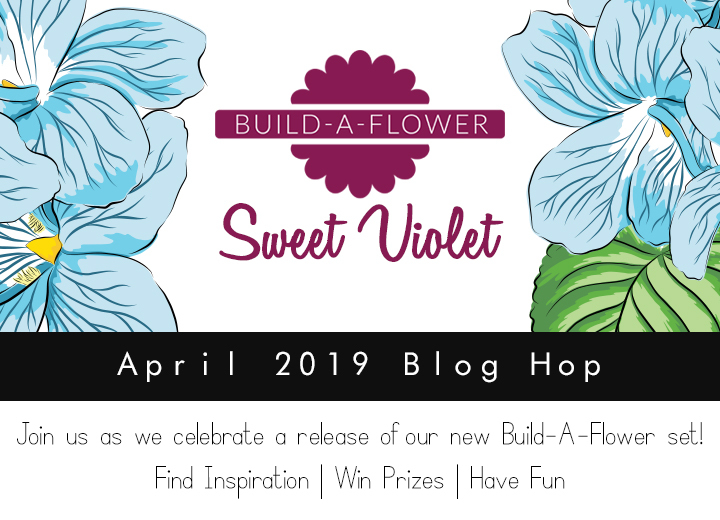 The winner will be announced on the Altenew blogs on April 9th, 2019. When I think your cards can't get any prettier, they do. Your violet wreath is amazing. Love the look of coloring on vellum! This is so pretty! Does the embossing damage the marker tip of Altenew markers? Just curious since there is always a warning in using Copic markers with embossing, that it can damage the marker tip. Oh Virginia! So sweet. I love your colors and a wreath never fails to impress! Wow! I wasn't sure that this stamp appealed to me but your wreath erased those thoughts. The delicate vellum blooms are amazing. Love the beautiful wreath. What a great use of the vellum to give transparency and depth. Love your gorgeous wreath of violets! So light and delicate with the vellum paper! Beautiful new set and a lovely card! 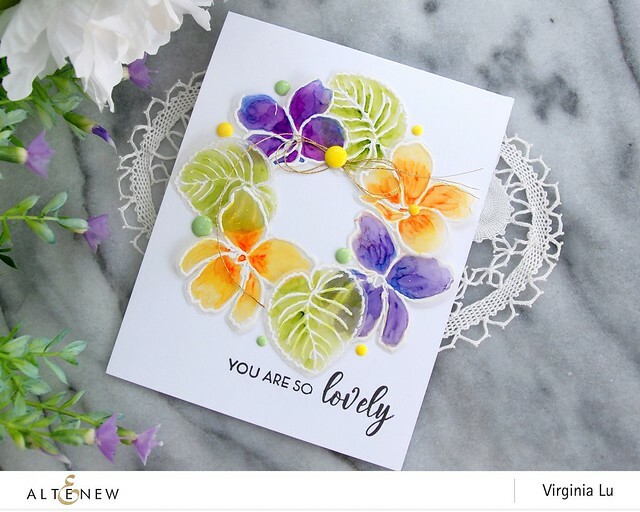 What a beautiful card...you captured the delicacy of the violets so well with the vellum. And the colors are just gorgeous. Your coloring on vellum is SO pretty and I love the wreath layout. A relatively simple design with a huge, gorgeous impact! A truly creative card! Circle of goodness for sure! These violets are o pretty embossed and colored on vellum - thanks for the inspiration Virgiina, I do not use vellum enough! The flowers look so pretty on vellum. Lovely card. Virginia, this card is just gorgeous! Love the transparency of the flors and how the colors play when layered! I love this card! Your card is absolutely stunning!! I love the colors! I love the purple and orange. These violets are so pretty and the card is gorgeous! Virginia, I love that you watercolored the flowers. I can't wait to try this myself. Your colors are so vibrant. Great job. Gorgeous card! I love your colors. Your flowers are beautiful. Almost like they are see thru. Gorgeous! What a clever use of the stamp and dies! Not that I am surprised, your talent is awesome. what a fun way to make a wreath! I love this beautiful card you made featuring the violets. By stamping and coloring the front side of the vellum, you have such nice saturation of colors on the flowers and the leaves. I would not have thought to then put those flowers and leaves in a wreath formation! What an awesome idea! 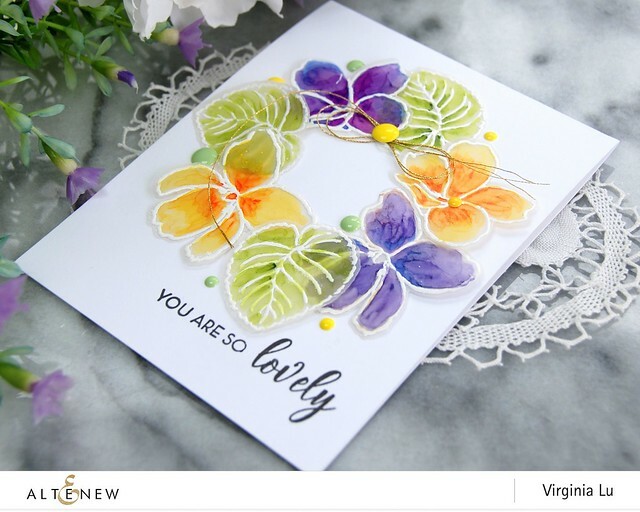 This is definitely one that I will want to try out, once I have my violets stamp and die set! Thanks for sharing your talent and your beautiful cards! 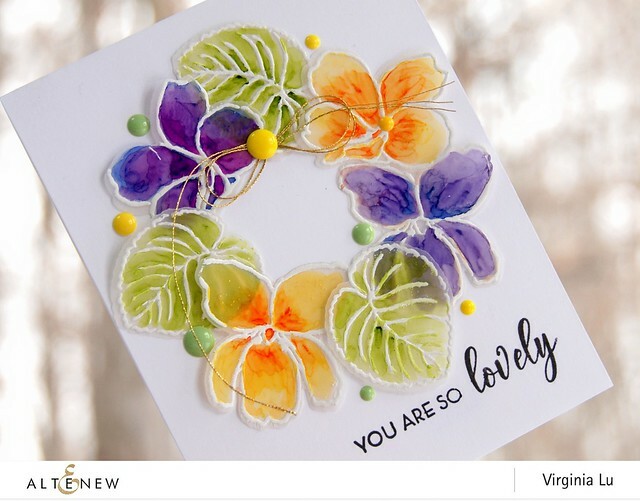 Margaret R.
This card whispers "spring" with its beautiful wreath. You've inspired me to think out of the box (for me) and try embossing on vellum. Lovely card. Very pretty and I love the colors! This wreath of Sweet Violet is breath-taking! I love the contrasting colors of the pretty blooms. So pretty! I love the white embossing and yellow and purple combo! This is GORGEOUS! I love the vellum coloring! A lovely Spring wreath!! Amazing! This is beautiful. I like both the design and the color choices for this new Altenew stamp! Oh my goodness! This is so beautiful with the golds and deep watercolors! Am really wanting this newest BAF! Your card is beautiful; love the use of vellum! Violets are one of my favorite flowers! The colours on the vellum are so vibrant. I really love the idea of making a wreath with the flowers. The Sweet Violets look awesome done on vellum and colored. And being in the wreath formation, and the beutiful coloing you makes this a very stunning card. Stunning card! Love the colours and the use of vellum! Oh my, Virginia, your sweet violet wreath is divine! I love the delicate and beautiful look you achieved! These look like real pressed flowers! I love this! Just beautiful, Virginia! The colors are so vibrant. Gorgeous wreath of Sweet Violets, brilliant and creative idea for these beautiful BAF blooms! Very pretty colors and I like the sheerness of the vellum. I've been hopping through all these beautiful art cards and I have to say that yours is my favorite of them all so far! Just gorgeous! Very pretty! Did you color them with the Artist Markers? I see they're mentioned in your supplies. But then the ink bundle is too & I doubt that you colored with the inks. This is so beautiful! I love the use of vellum, the coloring is fabulous, and the arrangement is so pretty. These are gorgeous! What a great idea to use vellum. I love your card it is absolutely stunning. Fantastic coloring on vellum, love your card! Gorgeous card Virginia. Love the embossed vellum flowers, gotta try this coloring technique. Thanks for the inspiration! Fabulous card! Violets are one of my favorite flowers and I love how you captured their sweet look. This is another beautiful flower! I love the fine veins on the flowers which make them look so realistic. Thanks for the wonderful card inspiration! Love the look of the vellum. I absolutely love your violets stamped on vellum. Such a pretty, unique look. And thanks for the tip on coloring on the front. I always do from the back, but I am definitely going to try your wray! Beautiful. I don't know why I'm intimidated by vellum but this is great! What a gorgeous wreath you created with the Violets. Love the different colors! WOW!!! You did an amazing job with this new flower set! WOW - your vellum flowers and leaves are STUNNING and EXCITING, your wreath design a DELIGHT! Beautiful card! Love your violet "wreath!" Great colors, too. Thanks for the inspiration. Beautiful card. Love the idea of using vellum. Wonderful idea to emboss and die cut on the vellum! It gives a lovely, light, airy feel - beautiful flowers! Nice card..like how you made a wreath with the flowers! Beautiful card. I love the colors and the unique style. This is one of my favorite BAF releases. Wow!! This is my favorite card yet!! Very beautiful!! I'm loving this look! The vellum is spectacular and iike the idea of the wreath. Great card! Wow your card is amazing! I love everything about it!